Where can you go to experience the excitement of Southern California, the lure of the big city, and the peacefulness of a trip to the seashore - all in one visit? The answer is Santa Monica, the Los Angeles area's true "urban" beach. For decades, Santa Monica has been "the" beach for those that live in and around the city of Los Angeles, including top-name stars in the movie and television industry. That's not to say, however, that Santa Monica can't be enjoyed by the average person. This vibrant beach community opens its arms to everyone and is close to most of Southern California's best attractions, making it easy to include on your itinerary - in between trips to Disneyland, Universal Studios, Hollywood, and other top tourist sites. 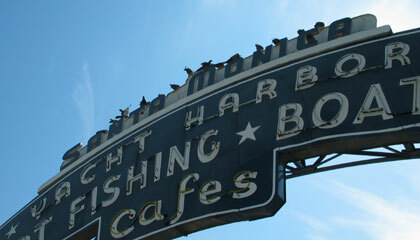 Santa Monica is also a wonderful place to stay while you're visiting the area. After a long day spent exploring Southern California, spending your nights at a beach hotel or rental will be a welcome respite after a busy day of sightseeing. Driving by car, take Interstate 10 west almost all the way to the end (Pacific Coast Highway). Exit at Fourth Street. Turn right onto 4th street then proceed to Colorado Street. Turn left. Park at Santa Monica Place mall, or find one of the parking garages on Second or Fourth Streets. If you are traveling by MTA public transportation, use the Trip Planner at Metro's website to get the route and schedule. After you enter your starting point, enter "Santa Monica Place" as the destination.